Hi. I’m Chook. But that’s not the name my mum and dad gave me. They called me Simon. But once, when I was little, someone called me a chicken. Then I was a chook. Then I was just ‘Chook’. Chook Doolan is a young boy who lives with his family and attends the local primary school. He worries about just about everything. He also notices all the places, all the people, all the happenings in his community. So when he is given a ukelele he’s keen to show busker friend, Eddie Two-hats. But when Chook reaches Eddie’s normal spot in the shopping street, keen to enlist Eddie’s help with ukelele-playing, his friend is not there. Chook knows that Eddie needs to busk to earn money for food, and that someone else will soon take his corner if Eddie doesn’t return. So Chook decides, despite his worries, that he will teach himself to play, and protect Eddie’s corner. Illustrations appear on every opening, with large and hypersize text and short chapters. ‘Chook Doolan’ is a new first chapter book series for young readers transitioning from fully-illustrated texts to chapter books. Chook is an engaging character who pushes through his worries, to help out his friend. He’s an observant, friendly and practical boy with well-developed problem-solving skills. That’s not to say that he is an island. He has a supportive network around him, in friends and family, ready to help as necessary, if necessary. Chook might have worries, he might not be the loudest boy in the world, but he demonstrates clear-thinking, empathy and is wonderfully grounded. Recommended for early-primary readers. Hi. My name is Simon, but you can call me Chook. This is me with my family. We’re the Doolans. I’m the small, scared-looking Doolan on the end. Chook Doolan would like to be braver. When his brother, Ricky, is sick, Mum is looking after him, and Dad is late for work, he realises he is going to have to walk to school alone. He’s not sure he’s brave enough. Dad tells him The Rule. Chook sets out determined to do exactly what Dad says. It’s harder than he thinks. He makes it to school without letting his fear overwhelm him, but now he has another problem – actually more than one. Each opening includes large font text and black and white illustrations. ‘Chook Doolan’ is a new first chapter book series from Walker Books Australia, featuring a young boy who is learning how to navigate his world. In Rules are Rules he thinks that adhering to his father’s ‘rule’ will help him stay safe on the way to school. He also discovers more about the community in which he lives. A realistic story for young readers making the transition from fully illustrated books to chapter books. Recommended for early-primary. Hi. My name is Simon Doolan, but most people call me Chook, which is another name for a chicken. I’m not a real chicken – don’t be silly. I’m just a boy. A not-very-brave boy. Chook Doolan is a not-very-brave boy, navigating a world that feels very big and a little scary. But he’s making friends and enjoying school. When his teacher, Ms Rashid, announces a ‘Bring your pet to school day, he discovers that his apparently fearless friend, Joe doesn’t have a pet to bring. Chook puts aside his own worries and decides to help Joe find a pet to take to school. But finding a pet for someone else isn’t easy. Text is presented in a large font with black and white illustrations on most openings. Chook Doolan: The Newest Pet is a new first chapter book series from Walker Books Australia. Chook would like to be braver, like his friend, Joe. Joe is about the bravest boy he knows. But when Pet Day is announced, it’s Chook’s turn to help Joe. These realistic and contemporary stories have short chapters and are ideal for young readers making the transition from fully illustrated books to chapter books. Recommended for early-primary readers. This story starts with a bell. There’s also the slanting sun, and the hawks overhead. The rooster and the goat and the town and the mist and the church above the clouds. There’s the radio, with its message that chilled the boy to the bone. It is April 1994. In Agabande, Rwanda, Pascal’s life is good. He has a friend called Henry who he loves to play with, a mother and father who love him. They are not wealthy, but there is food on the table and they work hard. His biggest problem is his pesky older brother, who shirks work whenever he can and plays tricks on Pascal too. But things have started to change. There is strange talk on the radio about ‘cockroaches’ and people around town are looking at each other strangely. The neighbours have left town without saying goodbye. Pascal’s parents tell him not to worry, but in one terrible night everything changes forever. 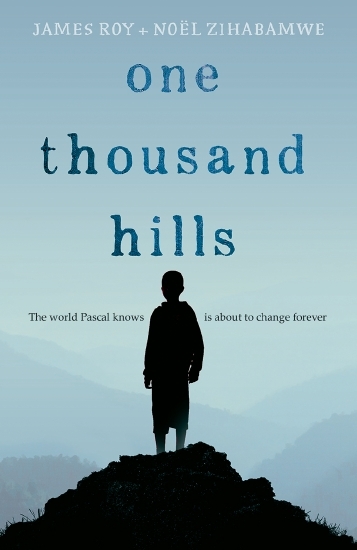 One Thousand Hills tells the story of the terrible events of 1994, where eight hundred thousand Rwandans were slaughtered in just 100 days, and many more were forced to flee the country. Told in third person from the perspective of young Pascal, but broken with interviews between Pascal and a school counsellor five years after the events, the reader is given the opportunity to witness the trauma of the events and their long term aftermath. Pascal’s experiences – and those of the people around him – are heart-breaking, and as a child character readers are given the opportunity to see the innocence of childhood being shockingly eroded. This is an important insight into both the events of Rwanda and to the experiences which bring refuges to our shores. This is my story. (Not this bit, though – everything that comes after this.) But like I said, this is my story. Me, Lizzie Adams. It’s a story about some stuff that happened to me, and to some of the people I know, and it’s completely true. All of it. because I don’t lie, honest. And if I do ever happen tot ell a lie or do something ‘silly’, it’s always an accident. Never on purpose. Lizzie is often in trouble at her school, Our Lady of the Sacred Wimple College, so when she almost sets the school on fire, it’s the last straw. She finds herself expelled, and condemned to being home schooled by her mum. Mum is a teacher, so she knows all about how to teach Lizzie, but Lizzie isn’t impressed. At home there’s no playground, no friends, not even a proper recess. What she wants to do is to prove that she is responsible enough to go back to school, but that isn’t going to be easy. Miss Understood is a heart warming, gently funny tale of being good and being misunderstood. Lizzie wants to do the right thing, but it doesn’t always work out right, something most readers will relate to, and the story also deals with important issues including adult depression and family in a way accessible to young readers. Roy has a gift for making stories both entertaining and thought-provoking. The family day out that Charlie was looking forward to is now looking less promising. Instead of the proper zoo, Charlie, his twin sister Helen, their baby sister Abby and their parents have arrived at a petting zoo full of farm animals. The only ones who are happy about it are his parents and Abby. Charlie and Helen slip off by themselves to see if anything can be salvaged of their day. Dad was right – it was a surprise, and not a very nice one. But my sister was also right – this wasn’t the zoo. All the excitement I’d felt about seeing the wild animals and the birds of prey and the incredibly venomous reptiles, all the anticipation of the past couple of days had evaporated in an instant. ‘Dad, you’re joking, right?’ I said. The family day out that Charlie was looking forward to is now looking less promising. Instead of the proper zoo, Charlie, his twin sister Helen, their baby sister Abby and their parents have arrived at a petting zoo full of farm animals. The only ones who are happy about it are his parents and Abby. Charlie and Helen slip off by themselves to see if anything can be salvaged of their day. And that’s when they meet an called Capone. The day begins to spiral rapidly downhill. Somehow Capone escapes his paddock, and according to Farmer Phil, it’s Charlie’s fault. His efforts to help recapture Capone produce more chaos, until Charlie is sure things can get no worse. But of course, they can. And do. The best intentions are often unequal to the challenge of reality. And thank goodness! Where would fiction be without catastrophes? Spitting Imageis a new title from Walker Books ‘Lightning Strikes’ series. This series features short fast-paced stories that tip frequently into well-intentioned disaster. With hilarious results. Charlie’s efforts to help seldom turn out well, but bless him, he keeps trying. Upper primary readers will empathise with Charlie as he lurches from one misunderstanding to another, while apparently being outsmarted by a relative of a camel. And a young girl who witnesses every one of his failures and feels compelled to comment. Indignity on indignity. A fun read for upper primary readers. It was silent out on the plain, except for the scratch of the shovel against the sides of the hole. Some time ago, Edsel had heard the distant wail of the train as it headed back, reversing along that pencil-straight track from Widen. The train he and Jacq had planned to be on. The train they’d meant to catch. The train that would have taken them back to Verdada, back to the stagnant place of weary, hungry children held captive by the crazy Ben. but, though no fault of their own, they’d missed that train and now it had gone, leaving them alone out her to dig a hole in the dry earth under the wide, silent sky. Digging for what seemed like hours. Edsel and his friend Jacq are digging a hold for no reason that they can fathom. Except that a machine they’re calling Andy somehow indicated it was a good idea. Then they’re in a train tunnel deciding which way to go, what to do. They think they’re being led somewhere, but they have no idea why, or what for. And when they get there, things become even more confusing. Trains seem to play a part in their journey, but what part? There are dreams and not-dreams and it’s becoming difficult to tell the difference. Edsel needs to learn more if he is going to be able to rescue the children in Verdada from the despotic Ben. But it’s going to be a wild ride. Edsel is back in a third adventure, to wrap up this extra-dimensional series. Reality and fantasy combine to bring a time-and-place-shifting adventure. Edsel learns to trust his own judgement, and to understand just what’s important to him. ‘Ghostly Shadows’ reads like the mirror room at a fun fair, where the world stretches and shrinks, distorting all around you. There are themes of friendship, trust, power and betrayal. A wild ride through more worlds than can be imagined. Recommended for upper primary readers.